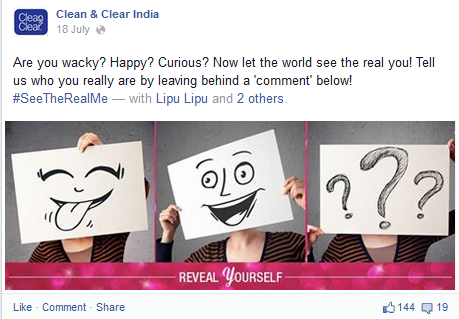 Clean & Clear is striving towards building confidence in teenage girls in its global campaign rolled out this year. The Johnson & Johnson brand for acne control has been relying on its advertising and social media led campaign ‘See the real me’ to reach out to teenagers and encourage them to be comfortable in their own skin. On a global level, the brand took on many non-actors to share what being real meant to them. A series of video documentaries feature girls who have chosen to pursue passions that challenge societal expectations. Through these stories of real girls and how they faced their inner fears by being themselves, Clean & Clear has been sending across a clear message to teenage girls – that the brand is a friend in building self confidence in them. For the ‘See the real me’ India campaign conceptualized by DDB Mudra, the brand chose the method of ‘street casting’ to make sure they did not cast any model/actor. Girls were invited to express their real side and the girls with the most genuine responses were chosen to feature in the TVC. In the 30-second commercial, a number of girls share their oily face problems and the name-calling they are subjected to like halwai, Ms. Chip-chip, Sticky-picky, etc. 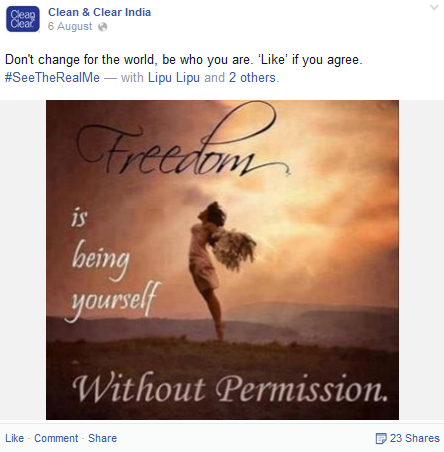 Post using Clean & Clear, they say that people have stopped calling them names and instead are recognizing them for their true selves. The ad ends with a display of the campaign hashtag, thereby implying the conversations on #SeeTheRealMe will carry on across social networks. Clean & Clear India, with the help of its digital agency Digitas LBi, has been spreading the new idea using the campaign hashtag on its Facebook page. With more than 788K+ fans and the most engaged age group being 18-24 years old, the brand has been encouraging its Facebook fans to be who they really are. Apart from sharing the new commercial, the Facebook page has designed a variety of appealing visual content to drive home the message. 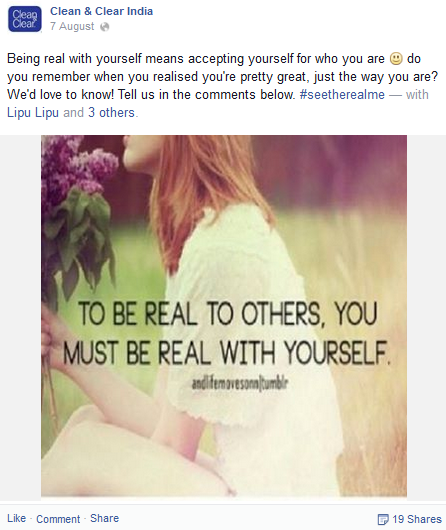 Content shared revolves around the importance of accepting who we are and not conforming to other people’s dictates. Fans have been invited to leave comments with defining who they really are. All accompanying text features the campaign hashtag #SeeTheRealMe. Teenage girls are an impressionable lot. In the social media age driven by impulsive sharing of personal pictures, events and happenings in our everyday life, girls in this age group are bound to be adversely affected by the conventional ideas of beauty and outer appearance. They suffer from low self esteem and cope with confidence issues; they often use Facebook as a platform to measure their appearance and feelings of self-esteem based on the response level they get from posting photos, as per studies of Facebook’s negative impact on teens. What Clean & Clear is embarking on, via its #SeeTheRealMe campaign, is to break this mindset of adhering to the world’s definition of beauty and confidence. It seeks to be encouraging teenage girls to be comfortable in their own skin, to celebrate their unique qualities and be proud of who they really are. In that sense, its a brilliant concept for a youth brand to incorporate into its advertising campaign and help reach out to the masses of teenage girls active on social networks. My only question is that the girls featured in the ad look ‘appealing’ enough to pass off as models?! The campaign also takes a whole lot of inspiration from the Dove ‘Real Beauty’ campaign that revolutionized the advertising space forever. Unilever’s personal care brand ‘Dove’ had created history when it celebrated real beauty by casting real women and not models in its ad. Clean & Clear is well on its way there. The use of the hashtag helps drive social media conversations and hopefully build confidence in teenage girls. A great way for an acne control brand to be an encouraging friend to their most active consumer segment. The campaign could lend itself to further brand building and engagement with the TG, what do you think?